Agriculture and herding spread gradually throughout sub-Saharan Africa from about 2000 B.C.E. until the end of the first millennium C.E. 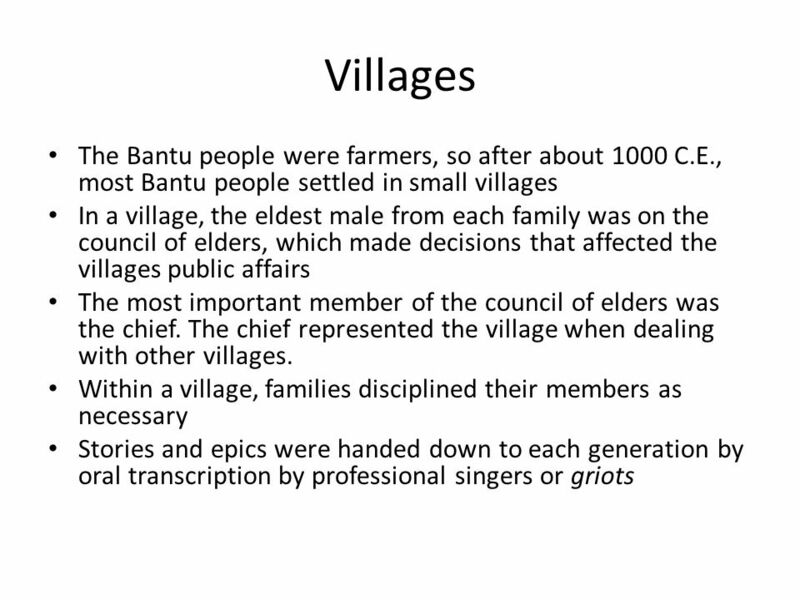 through a process known as the Bantu migrations. After about 500 B.C.E. the knowledge of iron metallurgy was also disseminating throughout Africa. 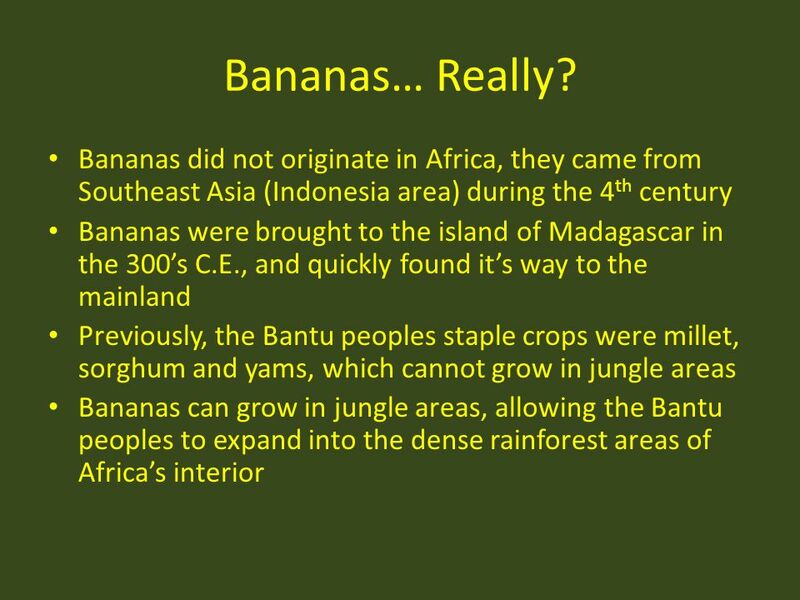 As a result of these movements, of the introduction of new nutritious foods such as bananas, and of long-distance trade, the population of Africa grew dramatically, and increasingly complex forms of government began to emerge. 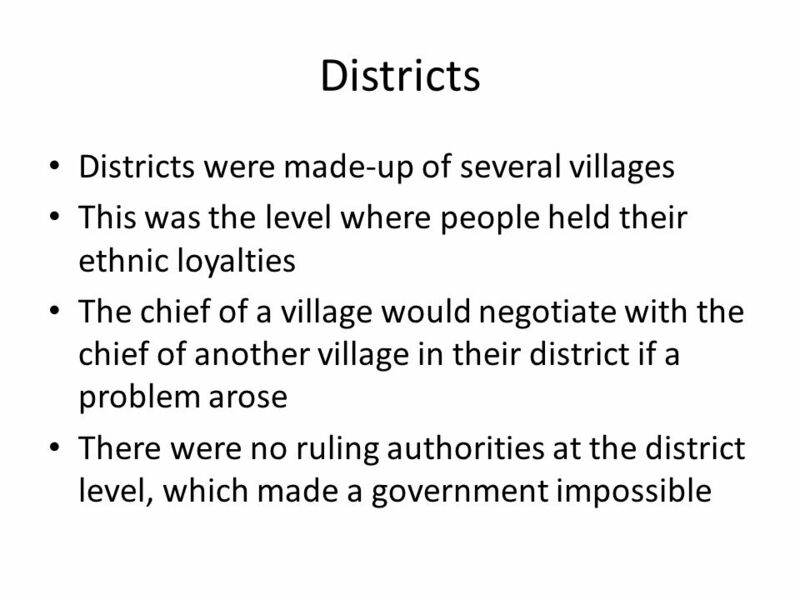 Most sub-Saharan African cultures were kin-based and organized into relatively small villages that were loosely allied into districts governed by a chief. Occasionally larger and more structured kingdoms and empires appeared. These larger states generally consolidated their position through controlling long-distance trade in their regions. 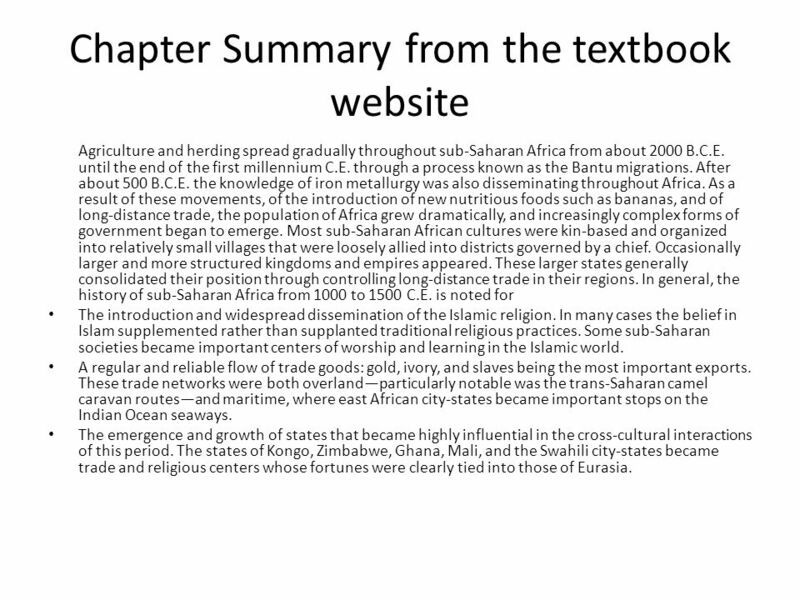 In general, the history of sub-Saharan Africa from 1000 to 1500 C.E. is noted for The introduction and widespread dissemination of the Islamic religion. In many cases the belief in Islam supplemented rather than supplanted traditional religious practices. 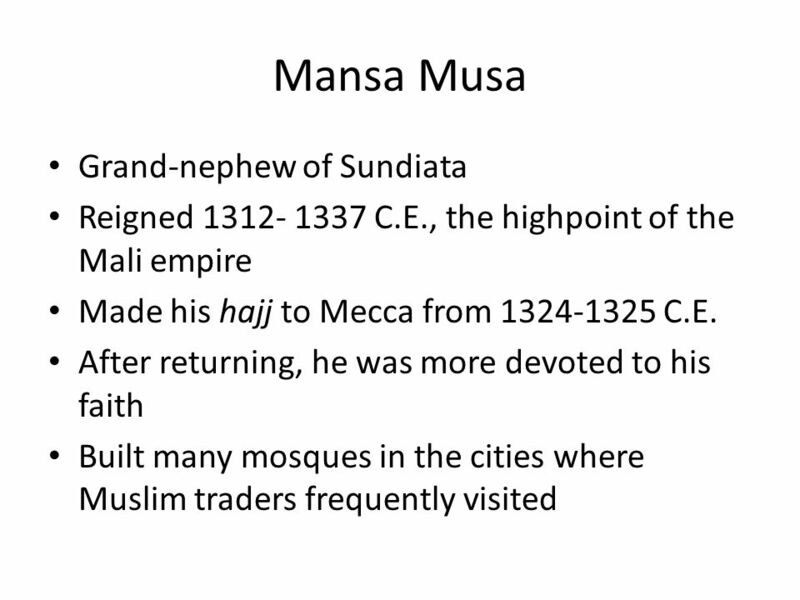 Some sub-Saharan societies became important centers of worship and learning in the Islamic world. 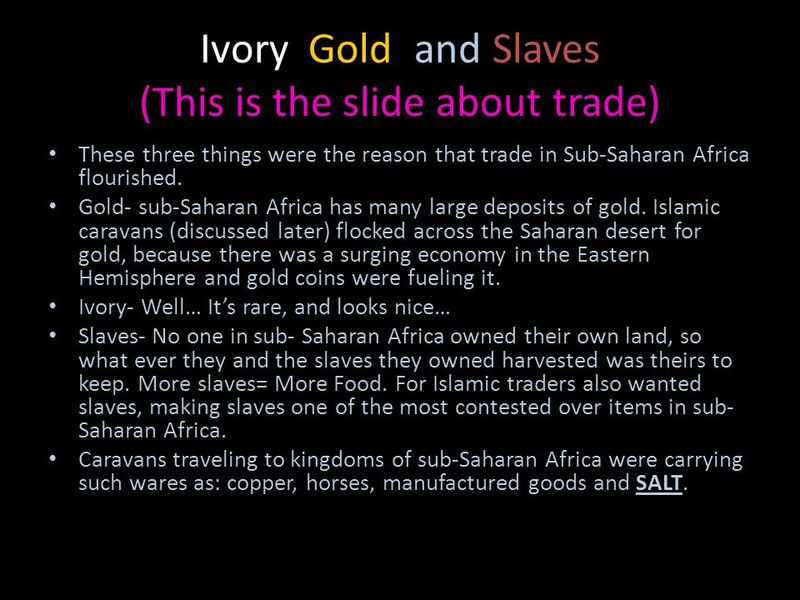 A regular and reliable flow of trade goods: gold, ivory, and slaves being the most important exports. These trade networks were both overland—particularly notable was the trans-Saharan camel caravan routes—and maritime, where east African city-states became important stops on the Indian Ocean seaways. The emergence and growth of states that became highly influential in the cross-cultural interactions of this period. 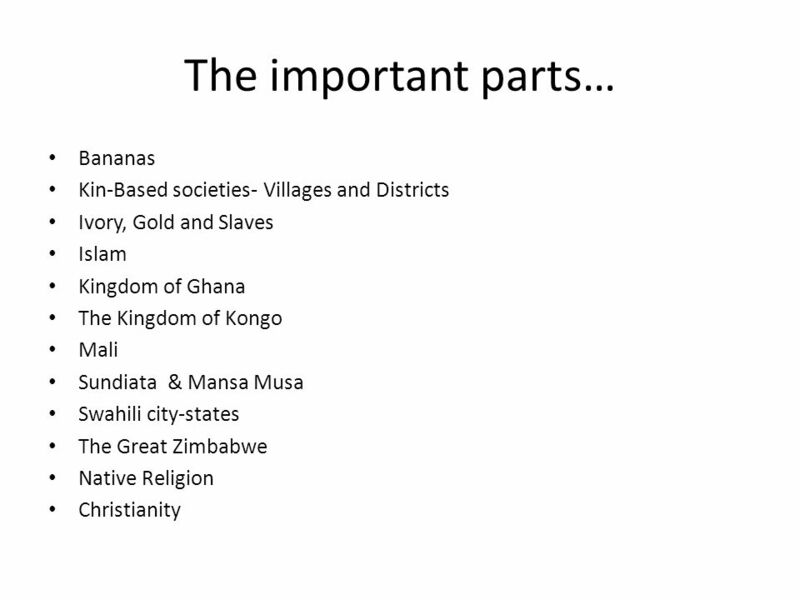 The states of Kongo, Zimbabwe, Ghana, Mali, and the Swahili city-states became trade and religious centers whose fortunes were clearly tied into those of Eurasia. 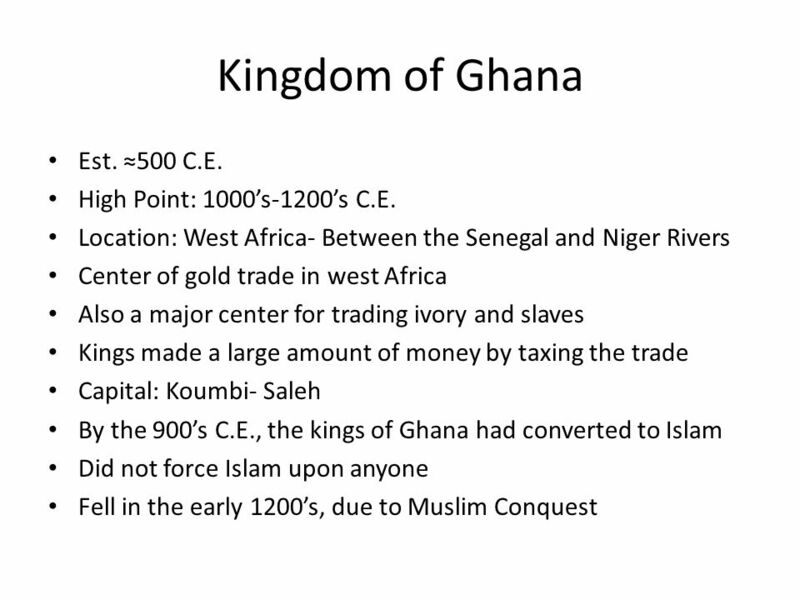 These three things were the reason that trade in Sub-Saharan Africa flourished. Gold- sub-Saharan Africa has many large deposits of gold. Islamic caravans (discussed later) flocked across the Saharan desert for gold, because there was a surging economy in the Eastern Hemisphere and gold coins were fueling it. Ivory- Well… It’s rare, and looks nice… Slaves- No one in sub- Saharan Africa owned their own land, so what ever they and the slaves they owned harvested was theirs to keep. More slaves= More Food. For Islamic traders also wanted slaves, making slaves one of the most contested over items in sub- Saharan Africa. Caravans traveling to kingdoms of sub-Saharan Africa were carrying such wares as: copper, horses, manufactured goods and SALT. 10 Kingdom of Ghana Est. ≈500 C.E. High Point: 1000’s-1200’s C.E. 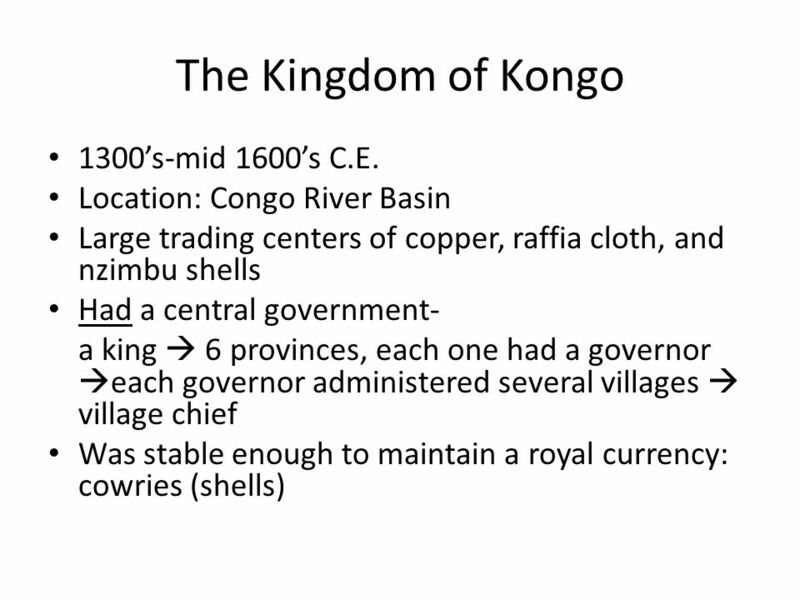 11 The Kingdom of Kongo 1300’s-mid 1600’s C.E. 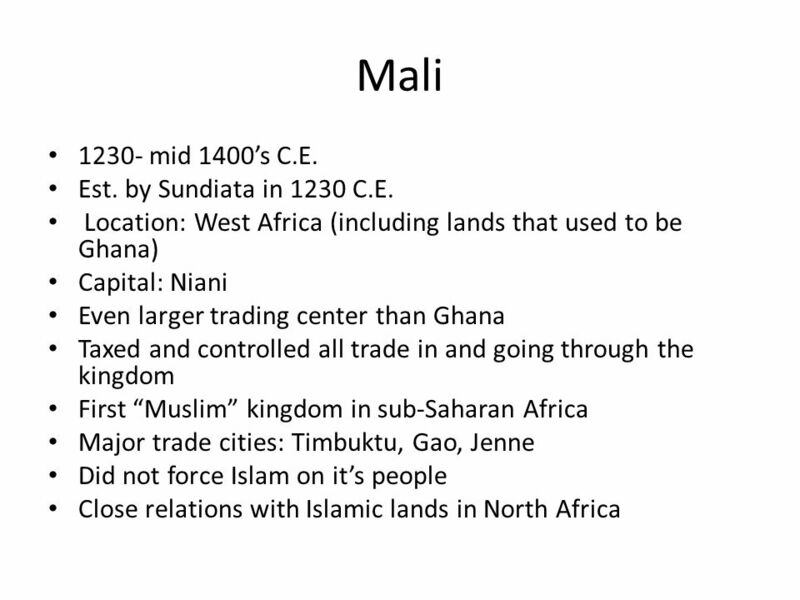 12 Mali 1230- mid 1400’s C.E. Est. 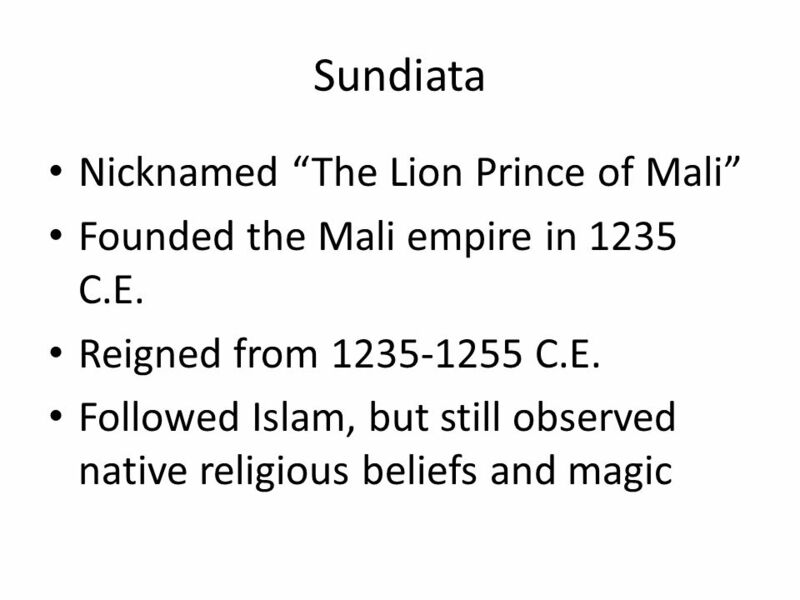 by Sundiata in 1230 C.E. 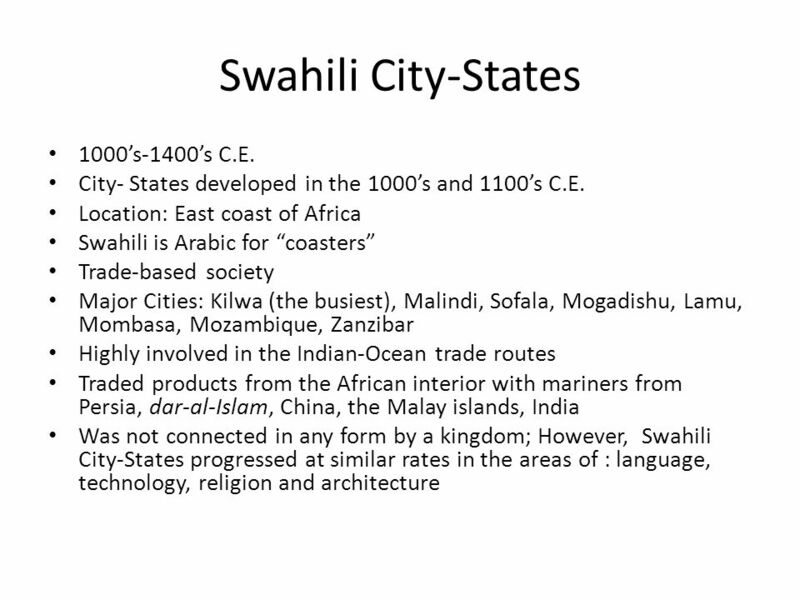 15 Swahili City-States 1000’s-1400’s C.E. 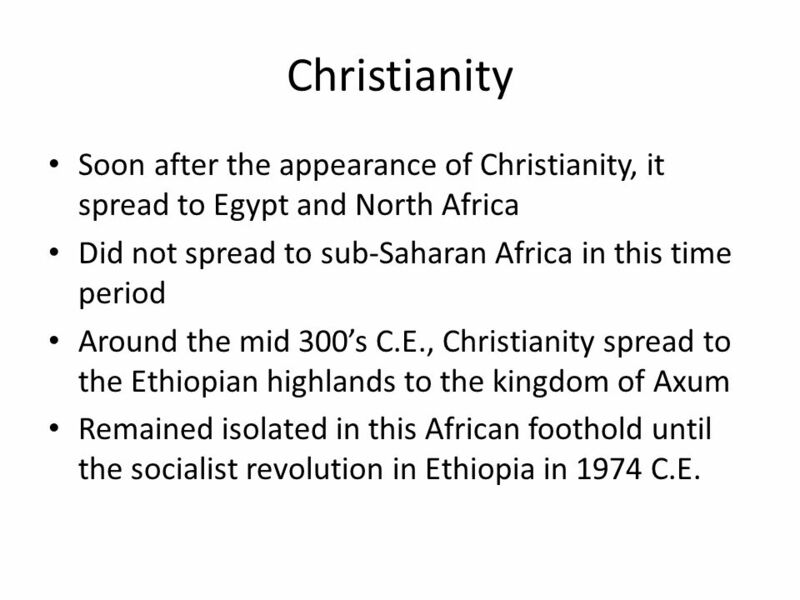 18 Christianity Soon after the appearance of Christianity, it spread to Egypt and North Africa Did not spread to sub-Saharan Africa in this time period Around the mid 300’s C.E., Christianity spread to the Ethiopian highlands to the kingdom of Axum Remained isolated in this African foothold until the socialist revolution in Ethiopia in 1974 C.E. 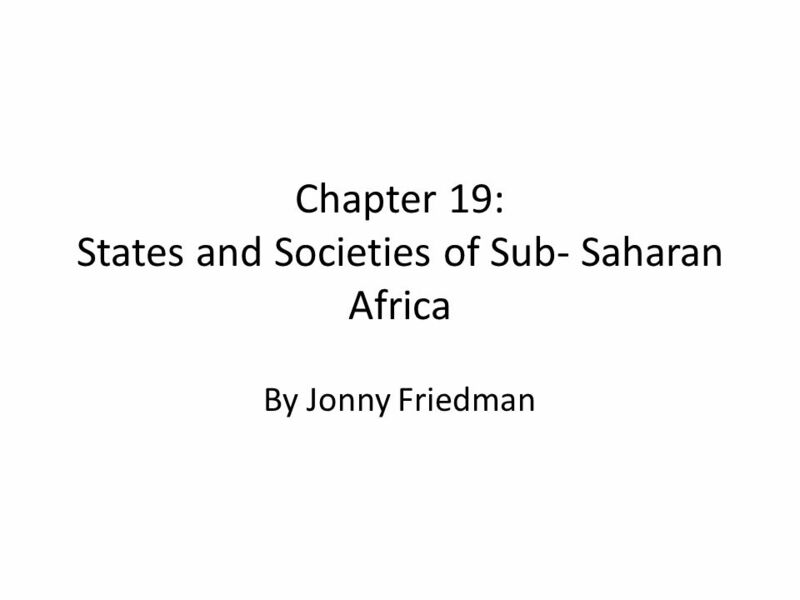 Download ppt "Chapter 19: States and Societies of Sub- Saharan Africa"
East and West. Trade in East Africa mixture of cultures Kingdom of Axum In modern-day Ethiopia Monsoon winds Axum trading ships crossed Indian Ocean From. By Margaret Myaskovskaya, Paula Reyes, Rebecca Wodzinski, Anam Choudhary, Signe Swanson, and Mariam Ali THE GOLDEN ROUTE. 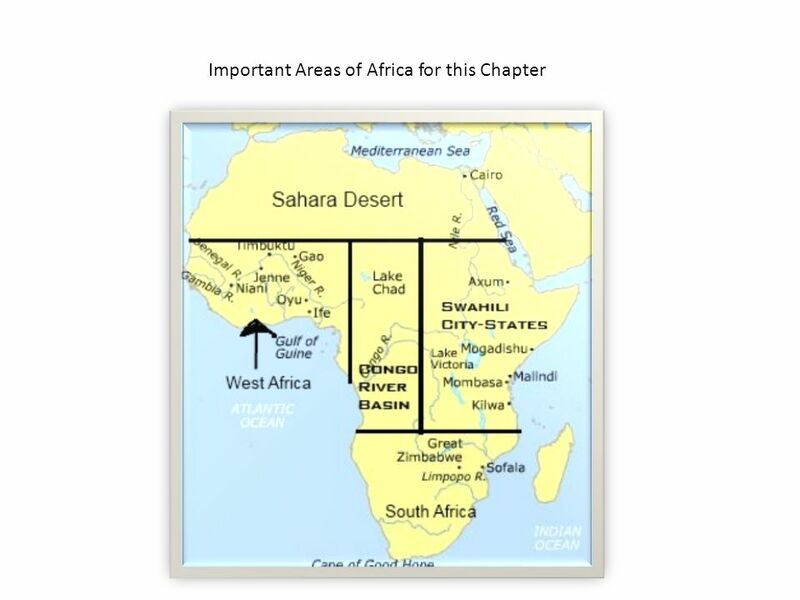 Before We Begin May be helpful to review Chapter 3 to refresh your thinking about Africa. Period of CE is often a time frame used in the essay. 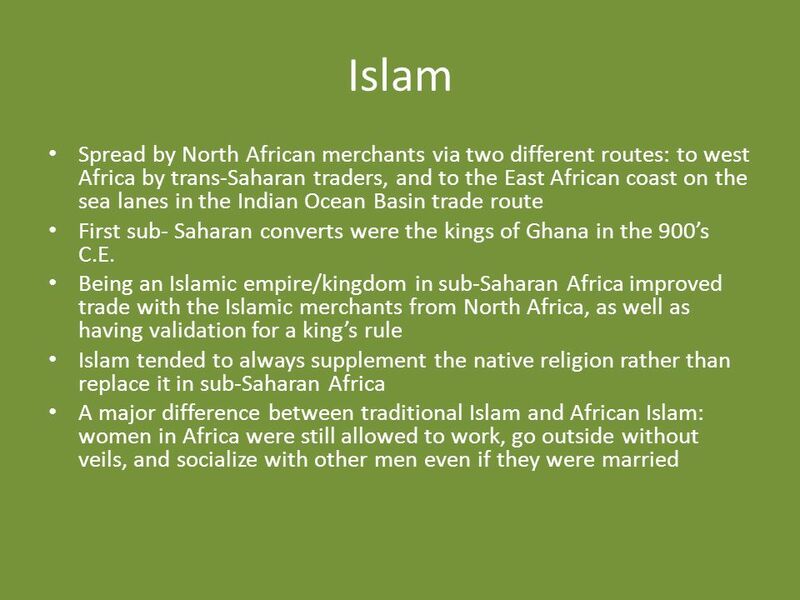 Africa and the Arrival of Islam Mr. Fenlon AP World History NHSS. Ancient Africa 1500 B.C. 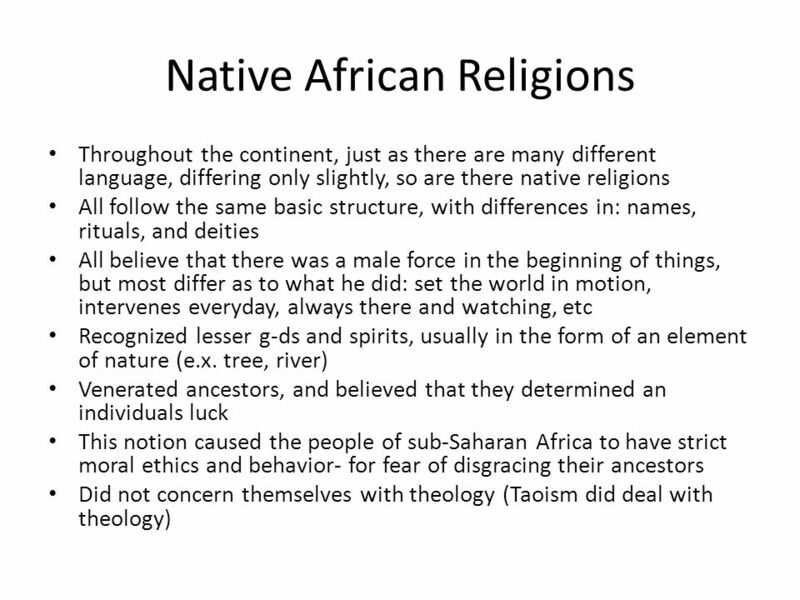 – 1500 A.D..
States & Societies of Sub-Saharan Africa AP World History Unit 2. If you were a new settler in Africa where would you want to live? Chiefdoms are societies headed by individuals with unusual ritual, political, or entrepreneurial skills. The society is kin-based but more along hierarchical. 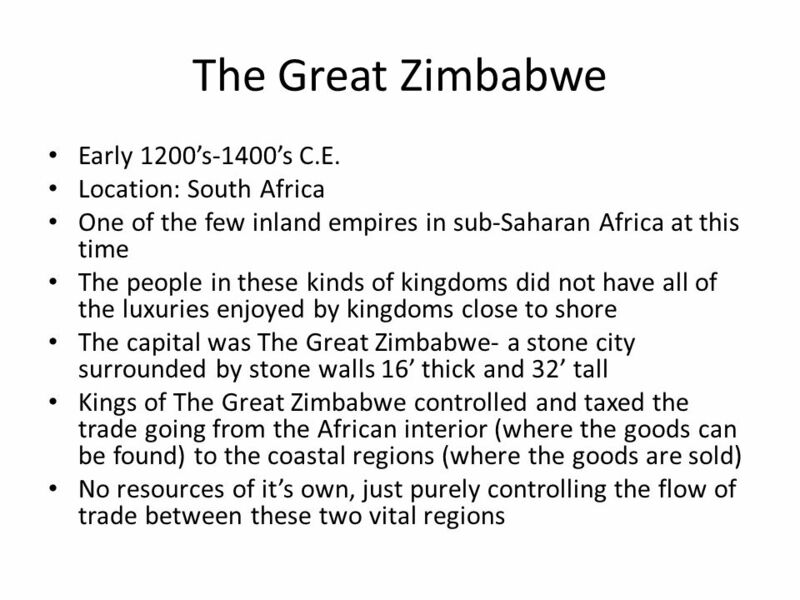 Civilizations of Africa Later World Civilizations.